Spencer Petty and Kimberly Cox, Miss Tennessee Queens met with Governor Bill Haslam. Miss Tennessee Teen Queen Spencer Petty and Tennessee Pre-Teen Queen Kimberly Cox met with Tennessee’s Governor Bill Haslam. 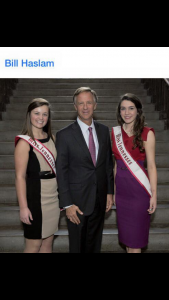 The girls had a great time going to the capital and meeting Governor Haslam, it was a neat outing and very educational. Previous Previous post: Bailee Smith, Miss South Carolina Pre-Teen danced for the Cancer Association. Next Next post: Kimberly Cox, Tennessee Pre-Teen Queen, has been representing National American Miss well!